Mark your calendars folks. The 17th Uptown Arts Stroll will take place from May 29 to June 30, 2019. The opening night reception goes down on May 28 at the United Palace. 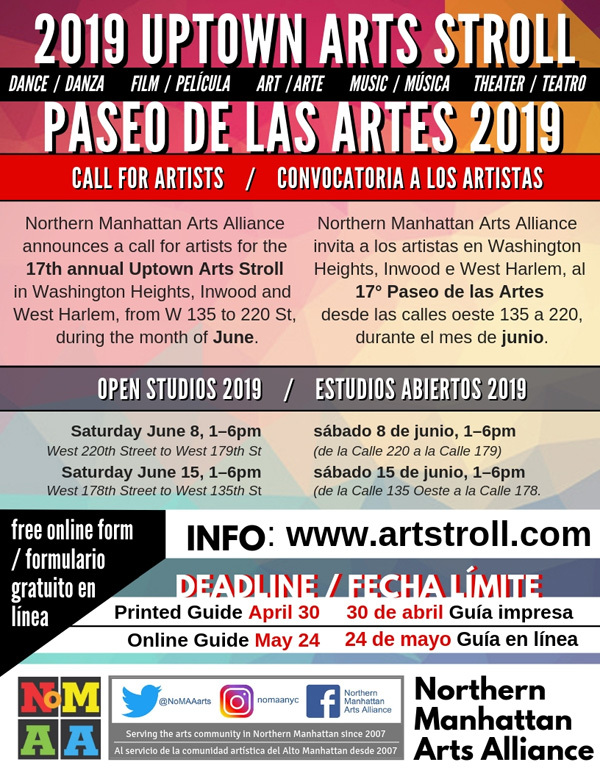 Artists may submit exhibitions, performances and open studios from West 135th Street to West 220th Street. Over 250 events took place last year. Find out how to submit your event here: artstroll.com/how-to-participate. You have until Tuesday, April 30 to have your event published in the printed Uptown Arts Stroll guide distributed by NoMAA and The Manhattan Times as well as being listed in the exhibitions or events schedule in the online guide www.artstroll.com.